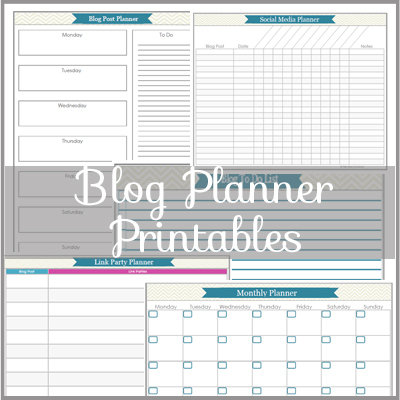 When I showed you my Filofax Flex Planner a couple of weeks ago, I said that I was sorting out my blog planner aswell and today I have the first of the printables that I made for my blog planner. I decided to make these printables quite simple and plain so that they don’t require to much ink from your printer as I love all the printables out there but they can eat ink if you print a lot. 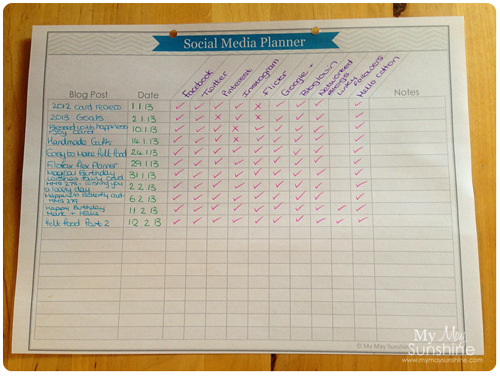 First off, I made a printable to record what social media I have used for each blog post. This is really handy in keeping track of all the social media outlets as there are so many options. Some social media, once you set it up will automatically update using the feed but others you need to keep a track of and you can see from the picture of my printable, that I can’t remember whether I posted on linky followers so this should help me remember and to check. 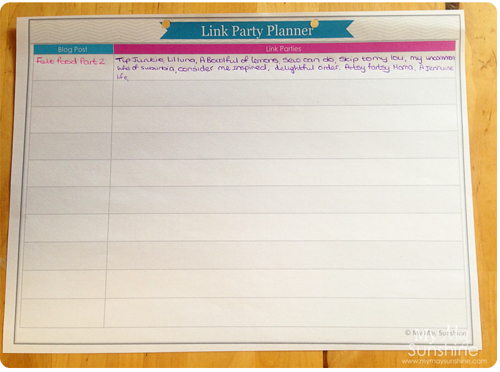 The next printable is a Link Party Planner. This is good if you want to record where you have linked your blog post up to, as there are so many link parties and you can get lost if you don’t keep a record of where you have already linked up to. The last printable today is one to keep a track of your blogs monthly statistics. This is nice to see how your blog is growing or if you need to improve it. If you would like the printables yourself, all you have to do is click the picture or the link below them and download them. These three printables are the first for my blog planner and on Thursday I will have some more to share with you, so I hope you will come back then to grab some more. Oh!!! I love this!!! You make awesome printables!!! I am going to use this for sure! Would you consider sharing this and any other projects that you might have at my Pinterest party? These are GREAT! I'm totally pinning them right now! Thanks so much. Have added it to your party already. You are so organized! I am too ADD to plan out too far in advance. Actually I have several posts started but I move them back when I come up with a better idea! Haha!